Earlier in the week, Wayne John from Southern California Web Development commented on how it would be great if you could subscribe via email to Technology Bloggers. This way you could read the latest and greatest content as an email, and then just visit the stuff that interests you to comment etc. 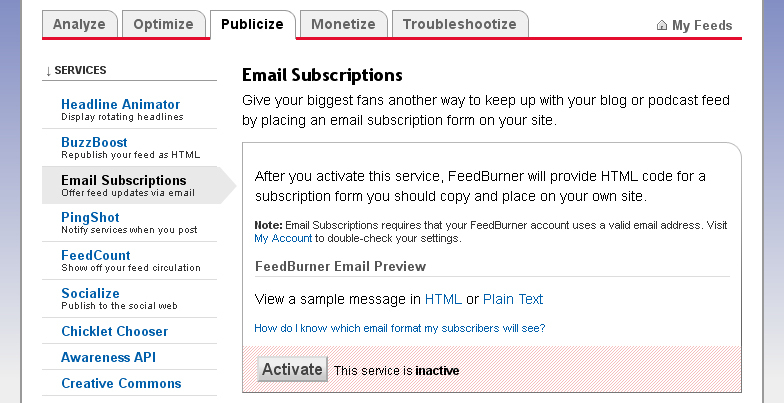 After a little puzzling I managed to enable FeedBurner’s email setting and add a subscribe widget to the sidebar. Enter your email address to get free updates about new articles! What do I need for people to be able to subscribe via email? Well first of all you need a feed. WordPress handles this nicely so that shouldn’t be too difficult! Second you need a feed manager. I use FeedBurner. It’s simple and easy to use. The problem with it at the moment is that it is really slow at updating, meaning that when I post an article at 2 in the afternoon, only 8 o’clock next morning does the feed update – for example. This isn’t a major issue for email subscription at the moment though. 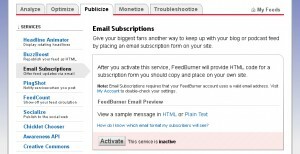 How do I enable FeedBurner email subscriptions? Click on the profile of the blog you want to enable emails for, then go to the ‘Publicize‘ tab. From here look down the sidebar and find ‘Email Subscriptions‘ – click that. You should then get a page looking a bit like the one in this picture. You will then be taken to a page called ‘Subscription Management‘. Here is where you get your code! Now you can ether get the box code or get the code which links to the subscription page. I chose to have a box, but you take your pick. Add the code to your site/blog and hey presto! Test it out yourself if you like, but the code should work and your readers should now be able to subscribe to your blog via email. Can I customise the FeedBurner code?